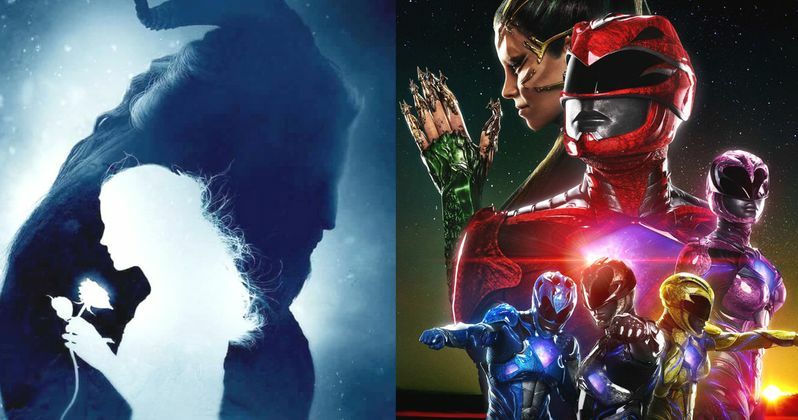 Can Power Rangers Beat Beauty and the Beast at the Box Office? Disney's Beauty and the Beast somehow managed to exceed the expectations of most box office analysts, with a record-breaking opening weekend of $174.7 million, beating the Sunday estimates by over $4 million. This long-awaited live-action adaptation broke Batman v Superman's record for largest March opening ever, and it also broke records for the largest debut for a PG movie, and had the biggest IMAX debut ever for a PG film as well. While it only opened against one other movie last weekend, the R-rated thriller The Belko Experiment, which debuted in roughly 1/4th of the theaters Beauty and the Beast was in, this live-action fairy tale will have much more competition heading into its second weekend, facing Lionsgate's Power Rangers, Sony's Life, Warner Bros.' CHiPs and River Rain's sports drama Slamma Jamma, although Beauty and the Beast should still easily reign supreme. Box Office Mojo reports that Power Rangers, Life, CHiPs and Slamma Jamma will all open nationwide, although exact theater counts weren't given yet. While there aren't enough reviews on Rotten Tomatoes for CHiPs and Slamma Jamma, Life is proving to be an early critical hit with an impressive 88% score on Rotten Tomatoes, while the Power Rangers remake has received mixed reviews, with a 50% score on the site, as of now. Those numbers will surely change as more reviews come in between now and the opening weekend, but we're predicting that Beauty and the Beast will have no trouble remaining at the top of the box office heap with a projected $90.3 million, with the rest of the pack unable to even make it a close race. We're predicting that, despite the middling critical reception, Power Rangers will easily take second place with a projected $36.7 million. Directed by Dean Israelite, the film stars Dacre Montgomery, Naomi Scott, RJ Cyler, Becky G and Ludi Lin as the Power Rangers and also features Bill Hader as Alpha 5, Bryan Cranston as Zordon and Elizabeth Banks as Rita Repulsa. The movie follows five ordinary teens who must become something extraordinary when they learn that their small town of Angel Grove, and the world, is on the verge of being obliterated by an alien threat. Chosen by destiny, our heroes quickly discover they are the only ones who can save the planet. But to do so, they will have to overcome their real-life issues and before it's too late, and band together as the Power Rangers. We're projecting that Life will follow close behind in third place with $31.4 million. Life is a terrifying sci-fi thriller about a team of scientists aboard the International Space Station whose mission of discovery turns to one of primal fear when they find a rapidly evolving life form that caused extinction on Mars, and now threatens the crew and all life on Earth. The film stars Jake Gyllenhaal, Rebecca Ferguson, Ryan Reynolds, Hiroyuki Sanada, Ariyon Bakare, and Olga Dihovichnaya. It is directed by Daniel Espinosa, written by Rhett Reese & Paul Wernick, and produced by David Ellison, Dana Goldberg, Bonnie Curtis and Julie Lynn. Executive producers are Don Granger and Vicki Dee Rock. Warner Bros.' theatrical reboot of the hit TV series CHiPs will most likely take fourth place with $24.2 million. Jon Baker and Frank "Ponch" Poncherello have just joined the California Highway Patrol (CHP) in Los Angeles but for very different reasons. Baker is a beaten up pro motorbiker trying to put his life and marriage back together. Poncherello is a cocky undercover Federal agent investigating a multi-million dollar heist that may be an inside job-inside the CHP. The inexperienced rookie and hardened pro are teamed together, but clash more than click, so kickstarting a partnership is easier said than done. But with Baker's bike skills combined with Ponch's street savvy it might just work...if they don't drive each other crazy along the way. While Slamma Jamma is expected to have a "wide release," it likely won't be wide enough to put it in the top 10 this weekend. We're predicting that the top 10 will be rounded out by Kong: Skull Island ($12.6 million), Logan ($9.3 million), Get Out ($7.4 million), The Shack ($3 million), The LEGO Batman Movie ($2.3 million) and The Belko Experiment ($1.7 million). Also opening in limited release this weekend will be Fox Searchlight's Wilson, Submarine Deluxe's documentary I Call Him Morgan, Monterey Media Inc's drama The Leveling and FIP's romantic comedy Phillauri. There isn't any indication yet if any of these limited release films will be expanding in the weeks and months ahead. Looking ahead to next weekend, Paramount will bring its live-action adaptation of the beloved manga series Ghost in the Shell to theaters, which will go up against DreamWorks Animation's The Boss Baby. Also opening in limited release will be The Blackcoat's Daughter, Carrie Pilby, Here Alone, Despite the Falling Snow, Here Alone, Live Cargo and God Knows Where I Am. Take a look at our box office projections for the weekend of March 24, and check back on Sunday for the weekend estimates.